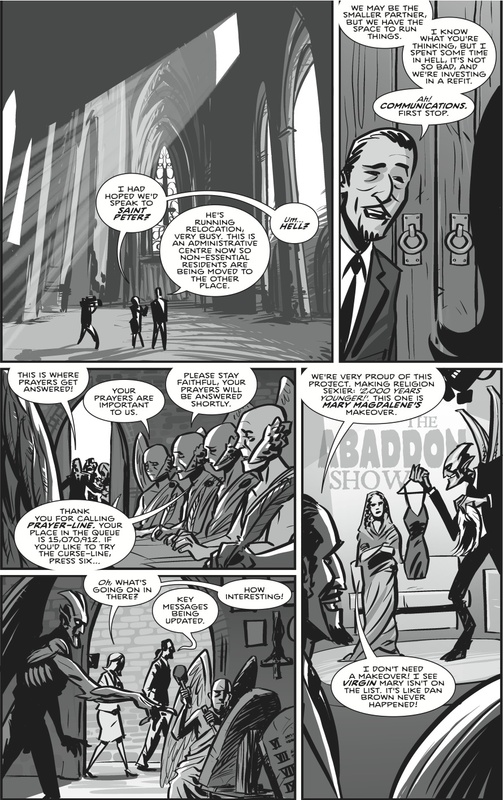 Time to share some pages from the inside of CROSS, our new comic anthology of politics, humour and trying to change the world (just a little bit). 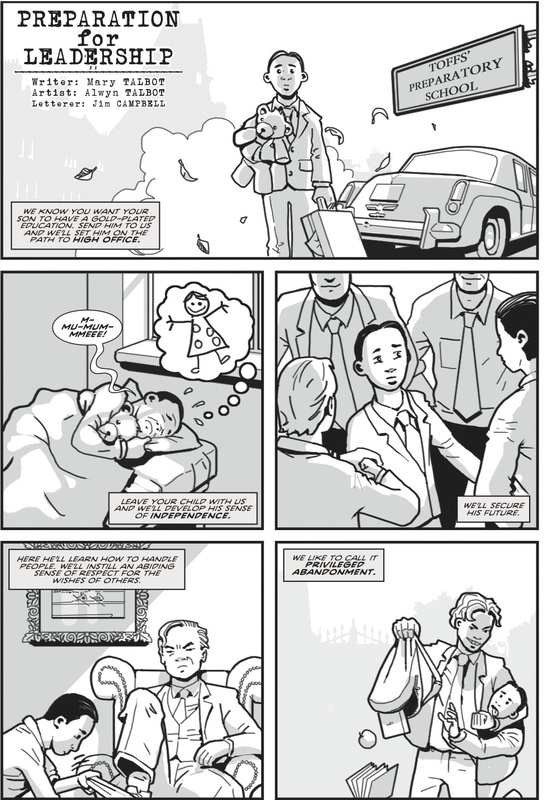 Here’s the opening salvo from Mary Talbot‘s story Preparation for Leadership, drawn by Alwyn Talbot. Want to know what follows? You can order a copy of CROSS over at our Comicsy shop – it’s £10 plus P&P. That gets you 64 pages of politics, humour, great artwork, fantastic storytelling, some thought-provoking prose and some of the best caricatures you’ll see this year. Today’s factoid, as I look at pictures of posh boys going to school: 33% of MPs were privately educated, compared to 7% of the general population. If you want the party lines, 59% of Labour MPs went to a comprehensive school, compared to 30% of Lib Dems and just 26% of Conservatives. Does this matter? Shouldn’t we be electing those who are best able to represent our interests, irrespective of personal or educational background? Isn’t it possible for someone to go to public school and come out the other side with a strong social and moral conscience and a liberal (small l) view of the world? Discuss. CROSS: in all its glory! The book was incredibly well-received at ThoughtBubble Comic Con in Leeds last weekend. 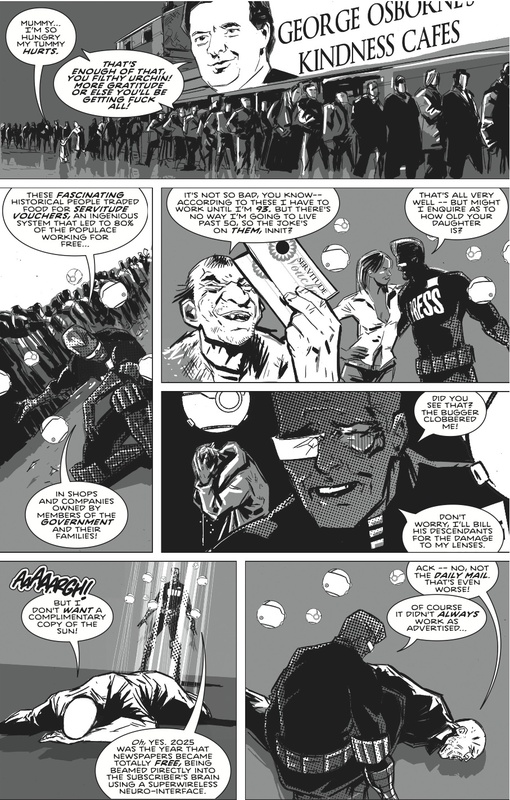 It seems we struck a chord with many people: those who were pleased to see comics taking direct aim at the powerful; those who supported the aim of the book to engage people with the social and political changes around them; and those who like to laugh at the world as they change it. Post- ThoughtBubble, Lizzie had great fun speaking at Laydeez Do Comics Leeds (thanks, Lou, for the invitation), and really seeing a grass-roots response to CROSS. We also made contact with two community organisations in Leeds, both working with young and disenfranchised people on a range of issues, and we’re going to share stories from CROSS with them as a way of sparking debate and building participation in local and community issues. WIN! So what’s it all about? Why not read more about CROSS? Or, if you’re ready to read a book of political comics and commentary featuring work from 2000AD’s Rob Williams, Emma Beeby and David Baillie, award winning graphic novelist Mary Talbot, British Comic Award nominee Owen Michael Johnson, and many many more, just head over to our online shop on Comicsy and order your copy now! For more such shenanigans, spoofs and silliness – as well as a couple of serious messages – order your copy of CROSS for just £10 plus postage at www.comicsy.co.uk/disconnectedpress. Frustrated at the state of the world? Don’t get mad, get CROSS! 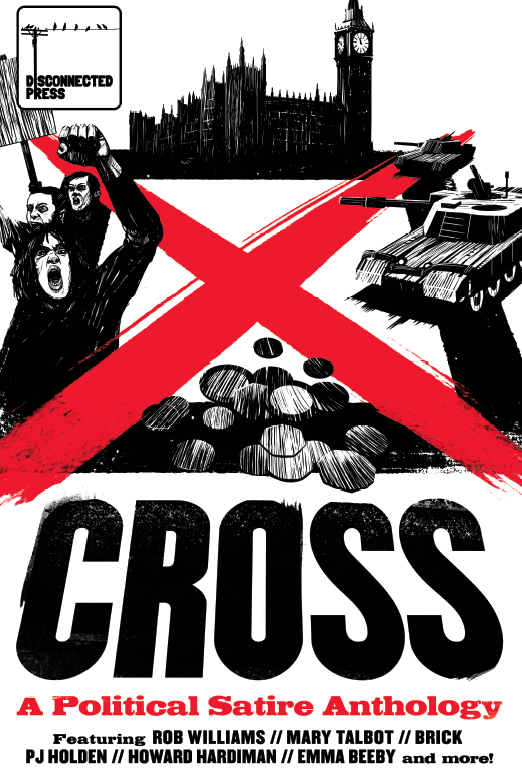 We’re delighted to announce that – tomorrow – we will have our hot little hands on copies of CROSS, our new comic anthology of political satire. I want to read more about CROSS. I’ve read enough and I want a copy! This second option will take you to our nice new shop on Comicsy, where you can order CROSS (and some of our other titles) and pay by debit / credit card or by Paypal. CROSS features an all-star line-up of established and emerging UK comics talent – over 25 creators all brought together to poke a stick at the establishment and see if it’s still alive. Following in the long tradition of satirical cartoons and comics, and taking a very British look at the world in which we live. There are also robots and flying squirrels, if you like that kind of thing. This weekend will see the launch of the CROSS anthology from Disconnected Press at Thought Bubble, a glorious assemblage of political wit, satire and polite British rage! And we do mean glorious, because Conor Boyle, the co-conspirator in the project with partner Lizzie, has sent us a preview copy which comes with a stonking cover from Pye Parr, and it looks fantastic! Don’t just watch the world in silence and frustration. Get CROSS! CROSS: five days til launch! 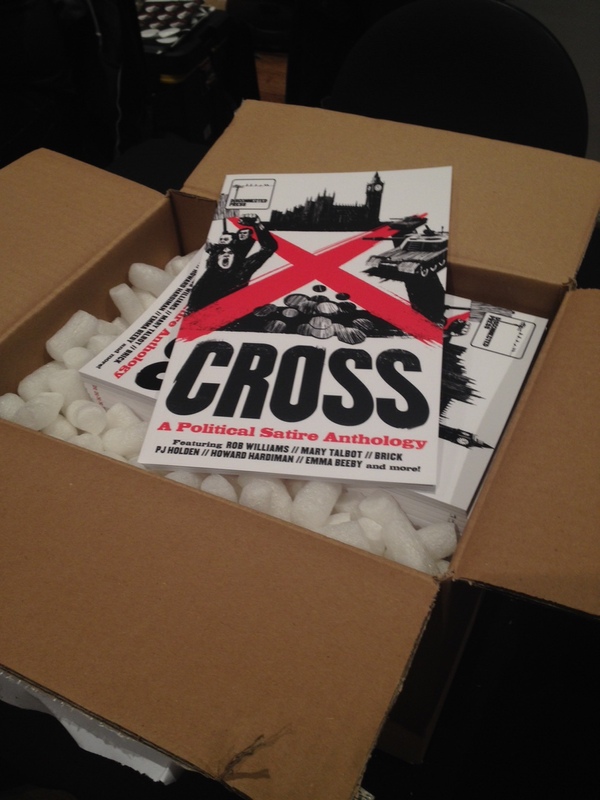 It’s five days until the official launch of CROSS, our new comic anthology of political satire. CROSS will go on sale at the ThoughtBubble Comic Convention at the Royal Armouries Museum, Leeds, on Saturday 15th November. You can find us at Table 84 in the Royal Armouries Hall (in the centre of the hall). We at Disconnected Press would like to say a big THANK YOU to everyone who has helped us along the way with our new anthology, CROSS. It means a huge amount to us to have had support from so many people over the past few months. Just to let you know, the book is now with the printers, those lovely folks at UKComics, and will be launching at ThoughtBubble, one of the UK’s largest comic conventions, on November 15th. For those who’ve already booked their tickets, you can find us in the Royal Armouries, at Table 84. We will be promoting the book at further comic conventions, in bookstores and with a variety of events and splashes in the period up to the General Election. We’ll keep you posted with more exciting developments! CROSS – now with even more amazing artists!